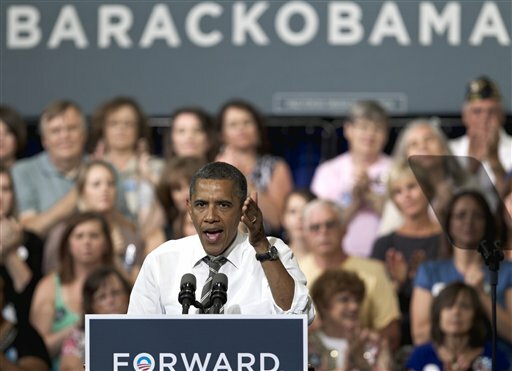 President Obama at a recent rally in Cedar Rapids, Iowa. You’ve probably heard by now that Mitt Romney and the Republicans have swept the fundraising floor with Barack Obama and the Dems for the second month in a row, beating them this time by a whopping $35 million. Lord knows we’re in deep trouble if that’s why Romney’s beating Obama so badly. We&apos;re getting outraised -- a first for a sitting president, if this continues. Not just by the super PACs and outside groups that are pouring hundreds of millions of dollars into misleading ads, but by our opponent and the Republican Party, which just outraised us for the second month in a row. We can win a race in which the other side spends more than we do. But not this much more. So I need your help. If you believe that regular people should decide elections, then please chip in $3 or more today. This isn&apos;t about me or the outcome of one election. This election will be a test of the model that got us here. We&apos;ll learn whether it&apos;s still true that a grassroots campaign can elect a president -- whether ordinary Americans are in control of our democracy in the face of massive spending. Please donate $3 or more before tonight&apos;s deadline. What a bunch of tripe, no? ("Good week"? Really?) These are as uninspired and cliché-ridden an effort as I’ve ever seen. Take out “Barack” and it could be any Joe running for any office. Here’s a suggestion, for free, to the Obama campaign: Try being a little more honest and a little less proud. Consider, for example, acknowledging that the economy is not great right now, and that you know that even $3 might be a bit much to ask for. You can follow it up with some poetry about how it’s an investment in the future, that you need four more years and a Democratic congress to get us to a better place but — for God’s sake, man — just say you know it hurts.